When Lawrence Fox's teacher announces that students will be presenting their collections at show-and-tell, Lawrence realizes he doesn't have anything to share. Luckily, Papa knows just what to do to help! Together, they venture into the woods. 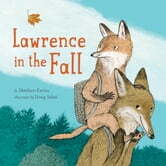 Lawrence is scared at first, but as he grows comfortable in the forest, he starts to recognize its magic, and how beautiful and unique each tree and leaf is, allowing him to gather a splendid, one-of-a-kind collection of his own!